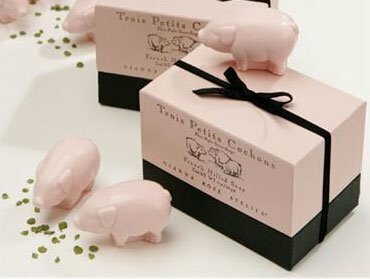 Gianna Rose 3 Piglet Soaps are three adorable pink piglet soaps. This triple-milled soap is vegetable based and scented with Fresh Linen. Each pig soap measures approx. 2.5" long and is 1 oz. Packaged in a pink and black gift box with ribbon tie. Manufacturer’s UPC number is 694430000732. Made in the USA.